The very first resolution passed by the United Nations, in January 1946, called for the elimination of atomic weapons. The bedrock treaty for the control and eventual elimination of nuclear weapons, the Nuclear Nonproliferation Treaty (NPT), entered into force in 1970 and has successfully limited the number of nuclear weapons states to 10 (out of 193 nations). Various treaties between the United States and the former Soviet Union and Russia reduced the number of nuclear weapons from nearly 70,000 in 1985 to under 15,000 today. And last year, 122 countries (but none of the nuclear states) approved the United Nations Treaty on the Prohibition of Nuclear Weapons (TPNW). Yet today, the “Doomsday Clock” stands at 2 Minutes to Midnight. The Secretary General has declared the dangers from nuclear weapons greater than at any time since the Cold War and has issued a new call to nations to resume negotiations to reduce nuclear arms. How have we arrived at this point and what do we do about it? That was the recurring theme of two conferences I attended in New York City recently: the International Campaign Meeting of Abolition 2000 (a global network to eliminate nuclear weapons) and “Two Minutes to Midnight,” convened by the International Peace Bureau. I came away from the experience with two overriding impressions: one, obviously, is the very real and enormous danger of this moment in history; but secondly, a realization of the vast network of individuals, groups, organizations, and members of the international community working to solve this problem. It is at once quite frightening but just a little bit hopeful. I would like to share a little of what I learned at these conferences. First of all, Abolition 2000 is a network of literally thousands of organizations and individuals worldwide working toward the elimination of nuclear weapons. Many of these organizations are themselves extensive networks of individuals and groups addressing their own particular issues and mobilizing forces in their own way, but share in this common goal. Some are large and well-known, like a group of Nobel Prize winners, the International Physicians for the Prevention of Nuclear War, and the International Peace Bureau. Some are less known but have long been working in their particular fields of expertise, such as the International Association of Lawyers Against Nuclear Arms or Physicians for Social Responsibility. Beyond this network, there are numerous parallel organizations, such as the International Campaign to Abolish Nuclear Weapons (responsible for the UN ban treaty) and Global Zero, religious groups like Soka Gakkai International and Pax Christi, and UN affiliated organizations like Unfold Zero and the NGO Committee on Disarmament, Peace, and Security. My point in this long list is to emphasize the numbers and range of organizations pursuing the common goal of nuclear disarmament. In the “Two Minutes to Midnight” conference, I learned how truly dangerous things are at this moment. There seems to be mass denial of the omnicidal nature of these weapons. The absolute myth of nuclear deterrence appears widely believed, and we have entered into a new era of nuclear arms build-up. The risk of non-state actors acquiring access to one of these devices increases by the day. Even the many accidents and near-miss episodes of unintended launches have not sufficiently alerted us to (in President Kennedy’s words) “the sword of Damocles” hanging over us by maintaining these arsenals. Long-time activist and author Noam Chomsky was the keynote speaker at the conference. He began his presentation by saying what he found as astounding as the current “rush toward global suicide” was the total lack of awareness or concern about it by most of the public. Daniel Ellsberg, appearing by Skype, described the terrifying reality of US nuclear war plans over the years, including the astounding unauthorized delegation to use nuclear weapons to theater commanders and lower level military chiefs. Several speakers pointed to the ways our own government has destabilized areas of the world and actually threatened to use nuclear weapons against other countries. Former United Nations High Representative for Disarmament Sergio Duarte bemoaned the fact the nuclear weapons states have not fulfilled their obligations under Article 6 of the Non-Proliferation Treaty to dismantle their weapons. Instead, he said, they have pursued a “culture of confrontation and privileged belligerence.” Princeton physicist Mia Zian observed “our systems of managing the world are not up to the way the world really is” in facing the existential threats of climate change and atomic weapons. Joseph Gerson, vice president of the International Peace Bureau, pointed to the renewed dangers of great power conflict and the need for a new framework for global common security. Given the sheer number of organizations focused on this issue and the enormity of the danger, how can one as an individual become involved to make a difference? My thought is to start at home. I have tried to raise awareness in my own congregation first by engaging our Peace and Justice Committee. Working with them, we’ve used articles in our newsletter, hosted films and speakers, conducted petition drives and letters to legislators to educate our members and offer concrete actions for people to take. A further step is to support the work of the UU United Nations Office (UNO). UNO director Bruce Knotts has long been a leader in civil society at the UN working on issues of peace and nuclear weapons, and is currently president of the NGO Committee on Disarmament, Peace, and Security. Among many UNO programs is this biweekly blog on disarmament. And all the while, at a personal level, it’s important to gain a solid grounding in the topic by availing oneself of the vast array of information on the internet and in the literature. The next step might be to identify community or state-level groups focused on nuclear disarmament. For me, Massachusetts Peace Action provided a network of engaged individuals to work with and learn from. I joined their Working Group on Nuclear Disarmament and became involved in their various projects, ranging from organizing a conference on Presidential First Use of Nuclear Weapons to a protest at a local site designated the Executive Office for the $1.5 trillion plan to expand the US nuclear arsenal. Finally, one can become involved with one of the many national or global groups I mentioned at the beginning. From contributing financial support, to joining working groups, to attending national conferences, to serving on boards, there are myriad ways to become engaged with these groups. It’s up to you to find a way of making a difference. 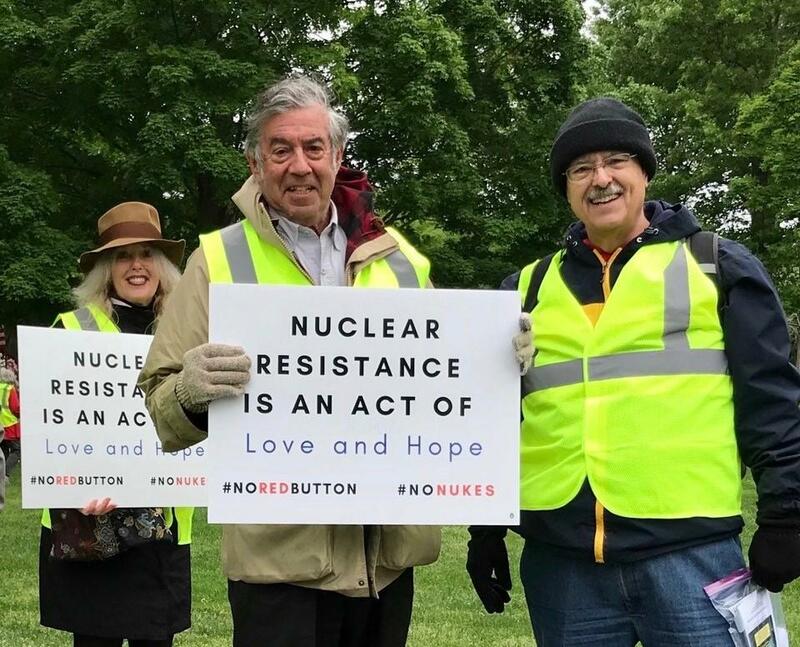 There is no greater urgency in achieving our Unitarian Universalist’s 6th Principle, the goal of world community, than working to rid our world of the scourge of nuclear weapons. This article was first published on June 6, 2018 by the Unitarian Universalist Association.